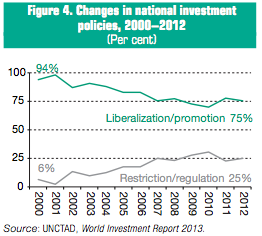 At least 53 countries and economies around the globe adopted 86 policy measures affecting foreign investment in 2012. The bulk of these measures (75 per cent) related to investment liberalization, facilitation and promotion, targeted to numerous industries, especially in the service sector. Privatization policies were an important component of this move. Other policy measures include the establishment of special economic zones (SEZs). At the same time, the share of FDI-related regulations and restrictions increased to 25 per cent, confirming a longer-term trend after a temporary reverse development in 2011 (figure 4). Governments made more use of industrial policies, adjusted previous investment liberalization efforts, tightened screening and monitoring procedures, and closely scrutinized cross-border M&As. Restrictive investment policies were applied particularly to strategic industries, such as extractive industries. In general, governments became more selective about the degree of FDI involvement in different industries of their economies. One important example of how governments have recently become more selective in their admission procedures concerns cross-border M&As. This report analysed 211 of the largest cross-border M&As withdrawn between 2008 and 2012, those with a transaction value of $500 million or more. In most cases M&A plans were aborted for business reasons, but a significant number were also withdrawn because of regulatory concerns, such as competition issues, economic benefit tests and national security screening, or political opposition. These deals had an approximate total gross value of $265 billion. Their share among all withdrawn cross-border M&As stood at about 22 per cent in 2012, with a peak of over 30 per cent in 2010. The main target industry from which M&As were withdrawn for regulatory concerns or political opposition was the extractive industry. As countries make more use of industrial policies, tighten screening and monitoring procedures, closely scrutinize cross-border M&As and become more restrictive with regard to the degree of FDI involvement in strategic industries, the risk grows that some of these measures are taken for protectionist purposes. With the emergence and rapid expansion of global and regional value chains, protectionist policies can backfire on all actors, domestic and foreign. In the absence of a commonly recognized definition of “investment protectionism”, it is difficult to clearly identify among investment regulations or restrictions those measures that are of a protectionist nature. Efforts should be undertaken at the international level to clarify this term, with a view to establishing a set of criteria for identifying protectionist measures against foreign investment. At the national level, technical assistance by international organizations can help promote quality regulation rather than overregulation. It would also be helpful to consider extending the G-20’s commitment to refrain from protectionism – and perhaps also expanding the coverage of monitoring to the world. 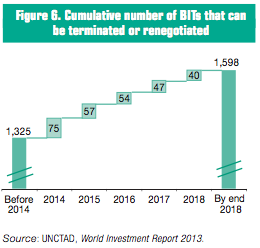 By the end of 2012, the IIA regime consisted of 3,196 agreements, which included 2,857 BITs and 339 “other IIAs”, such as integration or cooperation agreements with an investment dimension (figure 5). 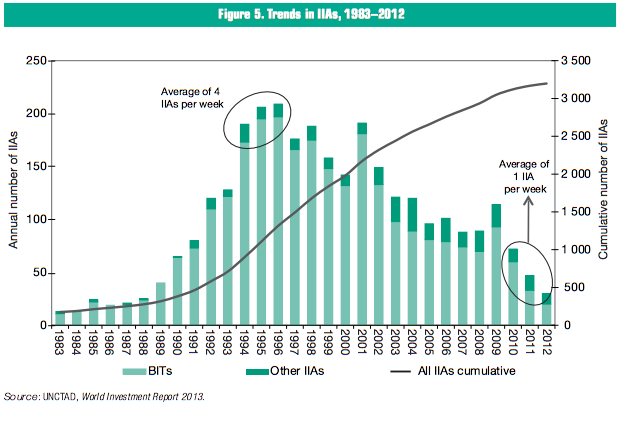 The year saw the conclusion of 30 IIAs (20 BITs and 10 “other IIAs”). The 20 BITs signed in 2012 represent the lowest annual number of concluded treaties in a quarter century. Investment regionalism is gaining ground: 8 of the 10 “other IIAs” concluded in 2012 were regional ones. Furthermore, this year, at least 110 countries are involved in 22 regional negotiations. Regionalism can provide an opportunity for rationalization. If parties to nine such negotiations (i.e. those where BITstype provisions are on the agenda) opted to replace their respective BITs with an investment chapter in the regional agreement, this would consolidate today’s global BIT network by more than 270 BITs, or close to 10 per cent. IIAs concluded in 2012 show an increased inclination to include sustainable development-oriented features, including references to the protection of health and safety, labour rights and the environment. These sustainable development features are supplemented by treaty elements that more broadly aim to preserve regulatory space for public policies in general or to minimize exposure to investment litigation in particular. Many of these provisions correspond to policy options featured in UNCTAD’s Investment Policy Framework for Sustainable Development (IPFSD). will be at the stage where they could be terminated or renegotiated at any time, creating a window of opportunity to address inconsistencies and overlaps in the multi-faceted and multilayered IIA regime, and to strengthen its development dimension (figure 6). In taking such actions, countries need to weigh the pros and cons in the context of their investment climate and their overall development strategies. In 2012, 58 new known investor–State dispute settlement (ISDS) cases were initiated. This brings the total number of known cases to 514 and the total number of countries that have responded to one or more ISDS cases to 95. The 58 cases constitute the highest number of known ISDS claims ever filed in one year and confirm foreign investors’ increased inclination to resort to investor–State arbitration. In light of the increasing number of ISDS cases and persistent concerns about the ISDS system’s deficiencies, the debate about the pros and cons of the ISDS mechanism has gained momentum, especially in those countries and regions where ISDS is on the agenda of IIA negotiations. The functioning of ISDS has revealed systemic deficiencies. Concerns relate to legitimacy, transparency, lack of consistency and erroneous decisions, the system for arbitrator appointment and financial stakes. As a response, UNCTAD has identified five broad paths for reform: promoting alternative dispute resolution, modifying the existing ISDS system through individual IIAs, limiting investors’ access to ISDS, introducing an appeals facility and creating a standing international investment court. IIA stakeholders are prompted to assess the current system, weigh the available options and embark on concrete steps for reform. Collective efforts at the multilateral level can help develop a consensus about the preferred course of reform and ways to put it into action.